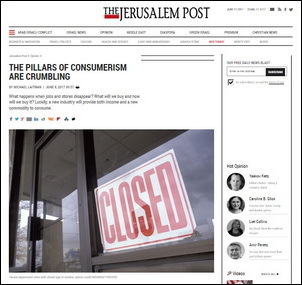 The pillars of consumerism are crumbling. For the past several months, there has been a landslide of large and midsize brick-and-mortar retail chain stores that have either filed for bankruptcy or announced the closing of hundreds of stores. If this pace continues, by the end of this year, over 8,600 brick-and- mortar stores will have closed their doors. By comparison, in 2008, at the height of the Great Recession, only 6,150 stores shut down. The rapid growth of e-commerce may be great for online businesses such as Amazon, but e-commerce does not require nearly as many jobs as do brick-and- mortar stores. The grim conclusion is that as far as traditional retail jobs are concerned, we are seeing the end of an era. Question: How is it possible to know that a person has ascended spiritually in internal contact with the Creator and that it is not the ego deceiving him? Answer: This is a complex matter, yet I think that it is possible to feel it to the same degree that a person understands the books and the Kabbalah lessons in feeling. If a person feels that the lessons are having an influence on him and he wants to feel them more, this testifies to his advancement. The main thing is feeling because spiritual attainment is sensual. An Illusion Or A Taste Of Spiritual Experience? Do We Reach Beyond The World Of Atzilut? Question: The four phases of the development of the creature are found above the world of Atzilut, but if we don’t attain this, how can we talk about it? Answer: What is above the world of Atzilut we attain within the head of the world of Atzilut. Baal HaSulam described the world of Ein Sof when he was in the head of the world of Atzilut. Question: What is the practical implementation of the principle of “The King’s glory is in the multitude?” After all, wherever there is crowd, it is usually the opposite situation. Answer: Indeed, you will not find anything wise where there is a crowd, but only stupid fantasies. But in a Kabbalistic society, it isn’t a crowd that gathers, but outstanding people who want to overcome their egoism and raise their yearning for the Creator above all the obstacles. Thus they unite, each with his own unique, upper impulse, and this is actually what determines the shared outcome that we attain in the connection between us, and in it, we reveal the Creator. Question: What is a convention, not in the physical sense, but inside a person? This question is hidden in each of us, and it is called a desire. When all of these small desires connect into one desire, it is possible to receive an answer about the meaning of life, and this is precisely what we get together for. Question: Some people say that Masonic Lodges were formed with the active participation of Kabbalistic groups. Who are the Freemasons and are they connected to the wisdom of Kabbalah? Answer: Freemasons are completely unaffiliated with the wisdom of Kabbalah. These are people who act in special relationships among themselves and they build a small closed society in their connection. It has nothing to do with Judaism, religion, and all the more so with the wisdom of Kabbalah. They believe that by performing certain rituals, they can impact their conditions of the conditions of those around them. I met with Freemasons in Rome and gave them lectures. They invited me to their ceremonies and explained what they meant, but I would not say that their rituals were interesting. It is very difficult to impress me because Kabbalah puts a person on such a level that after that there is nothing to be impressed by. Don’t look for anything mysterious in the world because whatever seems mysterious is only because we don’t know its nature. Be an absolute materialist! The wisdom of Kabbalah is the study of the upper nature, not the physics of our world. This is actually how it approaches every phenomenon and this is how it explains it. Therefore, it is open to everyone and does not require any initiations, incantations, secret signs, or special dress. Do you have a desire? Come and study the wisdom of Kabbalah. Afterward, everything will depend on you. You will manage to ascend above your egoistic nature and become Kabbalists, both men and women. Torah, Deuteronomy 21:10: If you go out to war against your enemies, and the Lord, your God, will deliver him into your hands, and you take his captives… . The Torah describes laws that everyone who works toward being like the Creator and is in a state of constant battle within him or herself should know. A person represents the entire world. To the degree we reveal reality, we begin to realize that all that is seen outside of us is really a reflection of what exists within us. And that is why all people, the inanimate, vegetative, and animal worlds, the entire universe, exist within me; they do not exist outside of me. In referring to the Torah, we say that a person must behave in a certain way toward animals or plants, meaning the animal or vegetative levels of egoism within a person. The same applies to the inanimate and human levels. “Men,” “women,” “virgins,” and everything else described in the Torah are our desires. When we work with them, this is how we define, sort, and bring them to the appropriate order of correction. The desires stay, we only change the method of their realization. This is the trick: actually, everything exists in me, but given this, when I see everything as being outside of me, it helps me to change my relationship from being directed inward to being directed outward; that is, I change only my internal vector. In reality, I am not going out of myself; rather, I begin to accept all that exists outside of me as existing within me, as my personal qualities. Therefore, I begin to experience that I include the entire world within me. This is the state of “a person is a small world,” which Kabbalah speaks of. Then, inside this world that has now become mine, I begin to exist, experience, and understand all things. This world is not egoistic. But it is inside of me because I changed my vector by not using everything for my personal “I,” but for those who appear as others outside of me. In this way, I correct my egoism (desire to receive) to the desire to bestow. And this desire is inside of me and cannot be attributed to another; only its vector is corrected. This is how I begin to sense the Creator, the upper force, filling me. That is why I don’t need to run from anything. I become a system that is called soul or Adam – Man. Does anyone else exist besides me? No one. I alone, and the Creator within me. How can he be my neighbor? He is part of me! But in this moment, he appears to me as being distant; that is why I attempt to bring him closer, until I become one with him. Along the way, there is a constant battle. It is impossible to consistently imagine that everything that exists outside of me, including outer space, is all in me, and I am just looking inside myself, watching the “film projector and a screen” that constantly spins in front of me that which I see as outside of me. This is the Creator’s amazing innovation that exists within a person. If each of us would only see all this just from their own perspective, but we see animals and fish,, we even see other people who have similar experiences. This means that I consist of multiple egoistic desires, each of which exists as I do. In what way then does my desire, my “I” that I am now trying to figure out and altruistically transform, differ from the desire that is appearing to me right now as the person next me? And he sees the world just like I do, and we understand each other and are able to speak with each other. What is this desire next to me? For instance, across from me sits a friend, affirming, “Yes, I see it like that also.” What then? Am I in him and he in me? It means that in me is some friend who exists absolutely independently, decides independently, and corrects himself independently. In order to understand this, we need to unite. But, aside from uniting, each of us also continues to remain in their individual egoistic desires and intentions. It turns out that each of us, like a pomegranate, consists of many of seeds. And this entire totality creates the sense of the whole world being like a beehive in which, on the one hand, there is a division into a tremendous number of honeycombs, and on the other hand, their unity gives us the sensation of the Creator. We are not able to experience this quality within ourselves in any other way. Each is an individual, and each experiences the world within him or herself. The assembly of all individuals, when they do not merge, but only unite above themselves, creates a level, which, on the one hand, consists of 600,000 parts, and on the other hand, is as if a single unit. That is, below it is 600,000 parts, and above is unity, in which the upper force is revealed.